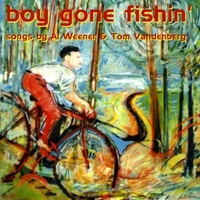 Boy gone fishin' tells stories, describes people we miss, and some we don't, times we have seen pass, and where we are heading. Some funny, some sad, some a bit naughty, Some a bit out there, like Meat & Dairy counter Bossanova. Boy gone fishin' is a scene in the ghost town New Richmond, Michigan. "Angel In White" Tom Vandenbergs remembering love's aura, a sweet Magical girl, an enchanted room, a moon so holy it had a thousand names.